It's time to harvest one of my favorite plants. 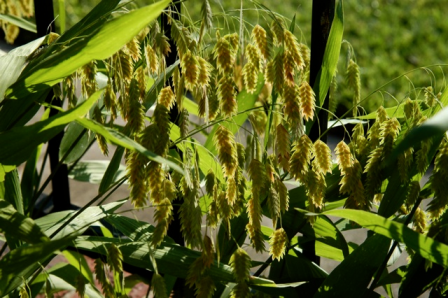 Inland sea oats seed are maturing and turning brown. The seed heads can be cut for attractive arrangements indoors, pulled off for planting elsewhere or left on the plants to completely mature and shatter. The last is OK, but all the seeds will germinate and there'll be plants growing all over the place. 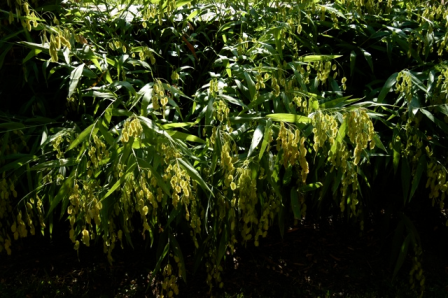 CULTURE: Easy to grow in any soil in shady areas. In large areas, sow ½ - 2 lbs. of seed per thousand square feet. Stems with dry seed heads can be cut for long lasting dry flower arrangements. Cutting the seed heads off before they mature helps to prevent spreading. VIDEO: Howard talks about Inland sea oats. 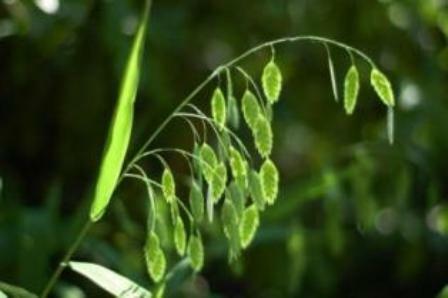 Join the Organic Club of America and receive Inland sea oats seed from Howard's Garden.